Awhile back Sherri at Overthrow Martha put out an article talking about using Thieves Household Cleaner (THC) as an all natural stain remover. It looked interesting, and I’m all about trying to go as natural as possible. So I figured I’d put it to the test the next time I got the chance. Unfortunately, that “test” would come sooner than I hoped. A few days after reading the article little man had an unfortunate night. He woke up soaked all the way through! And apparently he had been soaked for awhile (and we’re not just talking #1 here people!) because there was poop in several places on his white sheets. Sigh. Those were cute. 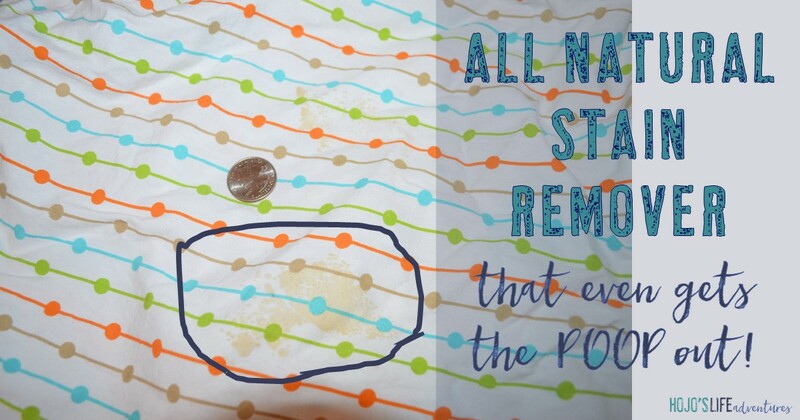 Here’s what those lovely poop stained sheets looked like after about nine days sitting in the clothes hamper. They’re not horrible, but they could be a LOT cleaner. It was time to see if the Thieves Household Cleaner was really all it’s cracked up to be! I took a dropper and put drops directly on the stains. (You can really only see two of them in the picture. There’s actually four.) Sherri’s directions said to use a bristle brush. I’m lazy. I didn’t. I let the THC all natural stain remover sit there for about five minutes. People, I’m not kidding at all when I say I could literally see the poo disappearing before my eyes! The sheets went in the wash along with the rest of his clothes. We’ve been using THC as his detergent since his little body is not a borax fan of the other DIY laundry detergent I had made. So in went about two teaspoons. I put the lid down, said a little prayer, took a deep breath, and walked away. Half an hour later I was pleasantly surprised to not see a single stain when I took his clothes out of the washer. Forty-five minutes later. No stains. Nothing. Nada. Zip. Can you believe it?! WOW! 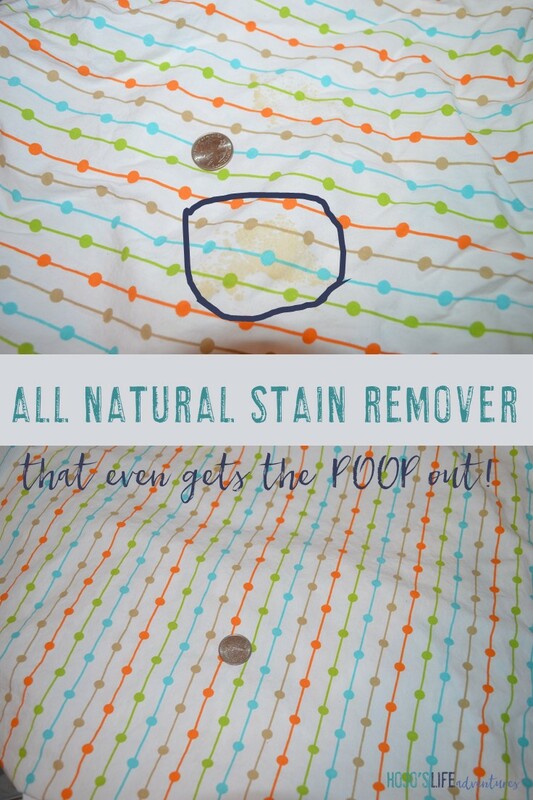 I can’t believe there’s an all natural stain remover that I can use to safely remove poop stains from my son’s clothing! Are you interested in learning more about Thieves Household Cleaner? I’ve got an entire blog post devoted to it right here (plus there’s a freebie!). Or perhaps you’re interested in more natural living products and ideas? I’d love to have you as a member of my team! Please click here to learn more.